LONDON, ENGLAND - George Bernard Shaw, Sir Edwin Luewtens, The Earl of Crawford, Lawrence Binyon and a host of Royal Academicans, artists, architects, sculptors and craftsmen have paid tribute to Walt Disney, creator of Mickey Mouse and the Silly Symphony films, shown above with an enlarged replica of his famed Mickey Mouse. They are members of the Art Workers Guild, which has decided to make Mr. Disney an honorary member because of his great gift to the art of the film and the happiness he has brought to the world with his animated cartoons. It is the first time that the films have been recognized by the British institution. Can anyone confirm the above date? Check out my blog - you'll see the original photo was taken in September 1932 at a meeting of the Breakfast Club in Hollywood. Walt sits astride the club's mascot, a wooden pony nicknamed: "Ham." I guess now the question is are there any photos the event described on back of my photo? I always love seeing original artwork be it animation, illustration or comic art. 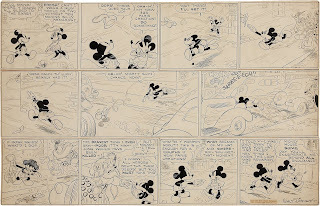 As I've probably mentioned in the past I really love the early Mickey daily and Sunday strips. There is something really special seeing Floyd Gottfredson's original artwork for these strips. This piece is currently up on auction at Heritage Galleries. The inking is superb, the lines crisp and clear. This work is very much in context with what was happening in the animation department at the time, it is of the very high standards that Walt was pushing in his animators.